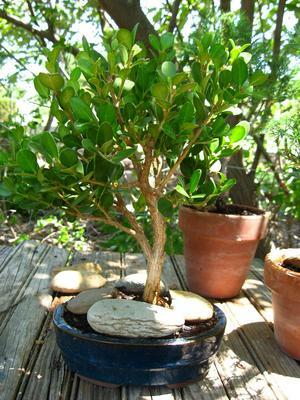 This is my boxwood bonsai tree that I have been growing since May 2012. I bought the pot at a nursery and bought the tree at Wal-Mart. It was originally just an ordinary boxwood shrub in the garden department and only cost about $6. It must have started out as a cutting, because the roots were a huge mass with a woody stem down the middle that I had to trim down quite a bit. I was afraid it would die after all that, but it's alive and growing! I've only been growing bonsai for about two years and mostly experiment through trial and error with trees that come up in my yard. Several have died, but right now I have two American Elms, three Eastern Red Cedars (although I think one of them is dying), and a little Ficus tree that I bought at a greenhouse. I'm still new at styling them and I don't own any proper bonsai wire yet, so I just allow most of them to grow how they want for now and just try to keep them alive and away from the rabbits!